Voyager Therapeutics is a clinical-stage gene therapy company that is focused on treatments for neurological conditions, such as Parkinson’s disease. This week the company announced positive results from its ongoing Phase 1b trial of their product VY-AADC01 (Click here to see the press release). I have previously discussed this company’s efforts (Click here to read that post). VY-AADC01 represents a new bred of treatment for Parkinson’s disease, as it is a form of gene therapy. The gene therapy involves inserting a piece (or multiple pieces) of DNA into a cell which will cause the cell to produce proteins that they usually do not. The introduction of the DNA is usually achieved using genetically modified viruses which have had all the disease causing component removed, allowing us to use the virus as an efficient delivery system. Viruses by their very nature are very good at infecting cells, so if we remove the disease causing components, what is left is a very efficient delivery system. Taking this approach one step further, we can take sections of DNA that contain the genes (these are the instructions for making proteins) involved with the production of a chemical called dopamine and insert them into our empty virus. Dopamine is a chemical in the brain whose levels are badly affected by Parkinson’s disease. By then injecting a virus with dopamine-production associated DNA into the brain, we can produce dopamine in any infected cells (it’s slightly more complicated than that, but you get the basic idea). Voyager Therapeutics‘s gene therapy product, VY-AADC01 is an adeno associated virus (or AAV) that carries a piece of DNA which provides the instructions (or gene) for making a protein called Aromatic L-amino acid decarboxylase (or AADC). And yeah, I know: what is AADC? AADC is the enzyme involved in the production of the chemical dopamine. Specifically, AADC converts the chemical L-dopa into dopamine. L-dopa is naturally produced in the brain from a protein called Tyrosine which is absorbed into brain cells from the blood. L-dopa is also the basis of many treatments for Parkinson’s disease (such as Levodopa – commercial versions of Levodopa include ‘Sinemet’). The majority of the dopamine produced in your brain is made in a region called the substantia nigra, deep inside you brain. These dopamine producing cells also generate another chemical called neuromelanin which has a dark colouration to it, making it visible to the naked eye. As you can see in the image below, the substantia nigra region is easy to see on the section of control brain on the left, but less visible on the section of brain from a person who had Parkinson’s disease. The dopamine neurons of the substantia nigra release their dopamine in different areas of the brain. The primary regions of that release are areas of the brain called the putamen and the Caudate nucleus. The dopamine neurons of the substantia nigra have long projections (or axons) that extend a across the brain to the putamen and caudate nucleus, so that dopamine can be released there. By injecting VY-AADC01 into the putamen of people with advanced Parkinson’s disease, Voyager is trying to make cells in that region start to produce AADC (which they usually don’t) and this will allow (in the use of Levodopa treatment) for the production of dopamine in the location where it is normally released by the (now absent) dopamine neurons. And this will hopefully help alleviate the motor features of the condition. It must be understood that this approach will not cure the disease, but it may make life a lot easier for those affected by it. And what were the results of the trial? Very agreeable is what they were. The phase 1b clinical trial was designed to assess whether the VY-AADC01 virus had any negative side effects in humans. The study recruited 15 people with ‘advanced Parkinson’s disease and disabling motor fluctuations’ – the average age of the participants was 58 years of age, with an average of 10 years of Parkinson’s disease since diagnosis). The participants were all treated with a single administration of VY-AADC01 (this is a surgical procedure which involves a syringe being inserted into the brain, and guided down into the putamen where the virus is injected). The primary objective of the study was to test the safety of VY-AADC01 in humans and determine how far the virus spreads once it is injected into the putamen. The secondary objectives focus on assessing the level of AADC produced and how active it is in the putamen, which is measured by positron emission tomography (PET) brain imaging. The researchers conducting the study were also interested to see if the product had any impact on the motor features of Parkinson’s disease and so they took measurements of motor function and activities of daily living (using the Unified Parkinson’s Disease Rating Scale (or UPDRS). Three different doses of the virus were used. The first group (Cohort 1) received the lowest dose of 7.5×1011 vector genomes (basically the number of viruses injected), while Cohort 2 who received a total dose of up to 1.5 × 1012 vector genomes and Cohort 3 received lower volumes 4.5×1012 vector genomes. Brain imaging of these subjects at 6 months post surgery, indicates that VY-AADC01 treatment resulted in a 13% increase, a 56% increase, and a 79% increase in the average amount of AADC enzyme activity in the putamen across Cohorts 1, 2, and 3, respectively. 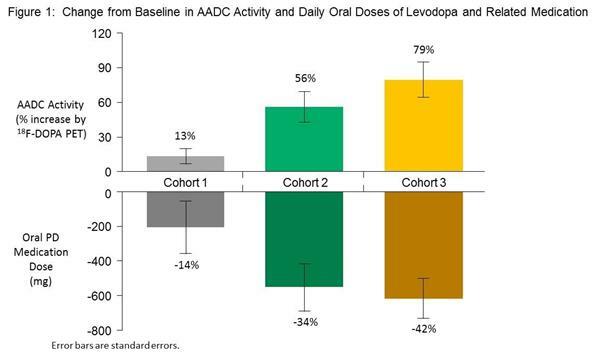 And this increase in AADC activity was accompanied by a reduction of the daily doses of oral levodopa that were being taken across all three groups (an average reduction of 208 mg (14%), 553 mg (34%) and 618 mg (42%) for Cohorts 1, 2 and 3, respectively). This is impressive. 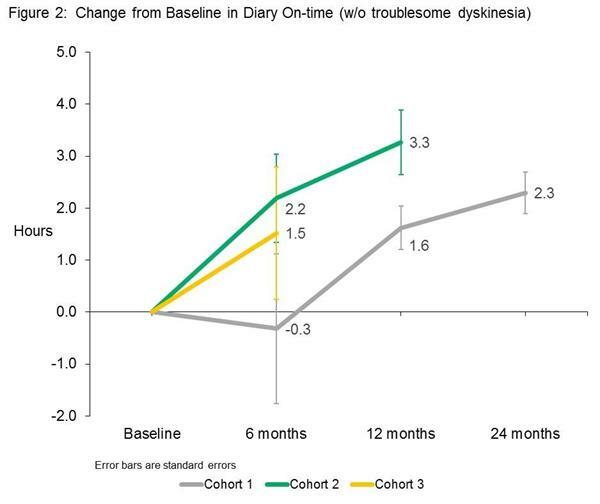 At 6 months post surgery, the investigators observed meaningful improvements in patients’ motor function, particularly in daily on-time (unrestricted movement while on medication) without dyskinesia. And this increase resulted in a reduction in the amount of off-time (restricted movement). It should be noted here that these measures were made by the participants themselves in diaries that they kept during the study. Note: The absence of 12 and 24 month data for cohort 2 & 3 is because the study is ongoing and that data has not yet been collected. Cohort 1 (on the lowest dose of VY-AADC01 were the first to start the study. One of the most interesting results in the study was the physician-rated motor examination which suggested that while the cohort on the lowest dose of VY-AADC01 treatment did not improve, the members of cohort 2 and 3 (the higher doses of the virus) demonstrated remarkable improvements (that is a reduction in UPDRS scores). Note that these improvements were observed while the participants were on their medication, but remember that all three groups were reducing their medication during this time. This result suggests that the placebo effect may have been in effect in cohort 1. 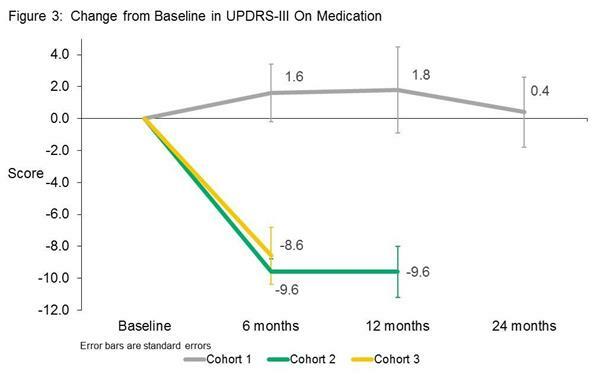 The change in UPDRS scores in cohort 2 & 3, however, is pretty impressive – compare the 8 to 9 point reduction in this study to the 1 or 2 points improvements seen in the recent Exenatide study (Click here for more on this). The important point to remember in this first phase I trial of VY-AADC01 is that the study was ‘Open label’. This means that everyone involved (participants and clinicians) knew who was receiving the treatment. VY-AADC01 now needs to be tested in a double-blind fashion. Reporting these results early, however, indicates that Voyager is very keen to move ahead with VY-AADC01. And indeed, they are already planning to begin the critical Phase 2-3 trial of VY-AADC01 in the first half of 2018. The company will continue to follow cohorts 1,2 & 3 from this first trial over the long term, and they plan to report updated results from this current trial in the first quarter of 2018. I’ll keep an eye out for them and update this post when they are available. Is anyone else working on gene therapy for Parkinson’s disease? Yes, but the success rate thus far has been….so-so. The first clinical attempt at gene therapy for Parkinson’s disease was attempted by a company called Neurologix ltd. It involved injecting a virus containing a gene called glutamic acid decarboxylase (GAD), which is an enzyme involved in the production of a chemical called GABA. The virus was injected into an area of the brain called the subthalamic nucleus, which becomes over-active in Parkinson’s disease. 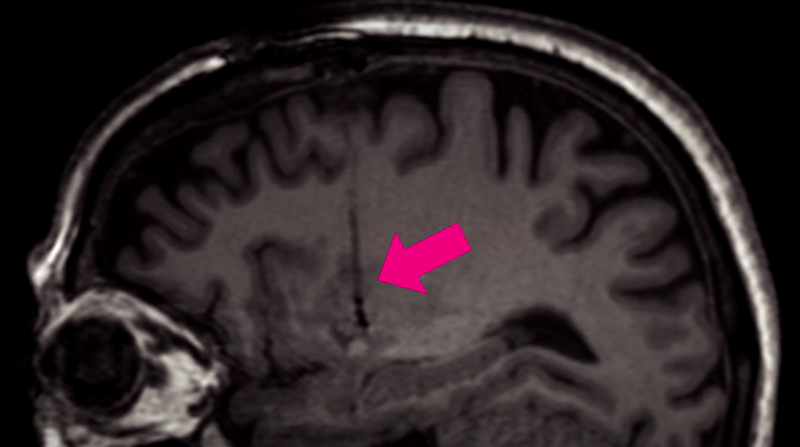 This brain structure is a commonly targetted site for deep brain stimulation operations. By introducing GAD production in the subthalamic nucleus, researchers were able to reduce the level of activity, but the clinical trials for GAD only produced modest results. The virus was well tolerated, but the clinical effect was limited. Another clinical trial (run by a company called Ceregene) attempted to cause cells in the striatum to produce a chemical called neurturin (which is very similar to GDNF – I have previously written about GDNF, click here to read that post). The goal of the study was to provide neuroprotection and regeneration to the remaining dopamine neurons, by releasing neurturin in the putamen. Subjects were injected in the putamen with the virus and then the participants were followed for 15 months. Unfortunately, this study failed to demonstrate any meaningful improvement in subjects with Parkinson’s disease. But it has not all been bad news! A good example of this gene therapy approach actually working is Oxford BioMedica‘s product called ‘Prosavin’ (or OXB-101). The scientists at Oxford Biomedica used their virus to transfer three genes – aromatic amino acid dopa decarboxylase (AADC – the same as Voyager Therapeutics (above)), tyrosine hydroxylase (TH), and GTP-cyclohydrolase 1 (GCH1) – into cells in the Putamen. These three genes are all critical in the production of the chemical dopamine. The scientists at Oxford Biomedica were hoping to reprogram cells in the putamen to start making dopamine, and that this reprogramming would result in increased levels of dopamine in the brain and reduce the need for Levodopa treatment. The clinical study was an open-label trial conducted over 12 months at two research centres (France and UK). It was designed to assess the safety and efficacy of ProSavin after the virus was injected into the striatum on both sides of the brain in 15 people with advanced Parkinson’s disease. Both research centres were registered as separate trials at ClinicalTrials.gov (NCT00627588and NCT01856439). Following the completion of the clinical study, Oxford Biomedica decided to move ahead with a more potent virus, known as OXB-102. Preclinical testing indicates that OXB-102 is at least five-fold more potent than ProSavin (based on behavioural and movement analysis). Oxford BioMedica is currently working on the regulatory approval for a planned three cohort phase I/II study of OXB-102 in Parkinson’s disease which will be conducted (in the UK and France). This sounds really fantastic. Right? Well, Prosavin was one of the success stories in the gene therapy world. But please remember that the first Prosavin study was an open-label trial. The Prosavin product really needs to be tested in a double blind study. This is particularly important because there was very little actual difference between brain scans of dopamine processing before the study started and 6 months into the study – this may be one of the reasons why the company is seeking a more potent virus. And this is one of the reasons why the Voyager Therapeutics results were so pleasing to see this week. Not only did the study find an increase in the production of AADC in the putamen, but it also provided evidence that the gene therapy approach can actually work for Parkinson’s disease. A biotech company has announced positive results for a gene therapy treatment in Parkinson’s disease. Although the trial was open-label, the results are still impressive given that the participants have all had the condition for approximately 10 years. The results announced the week are a big deal. Even though the clinical trial is open-label, the results represent the second example of gene therapy actually demonstrating an effect in Parkinson’s disease – which is a major milestone. The company, Voyager Therapeutics, seems to be very keen to move quickly forward with follow-up trials. It will be interesting to see how VY-AADC01 performs in a double-blind clinical trial. All going well, we shall find out soon. Watch this space. The banner for today’s post was sourced from Voyager Therapeutics. Had no idea you were such a space fan Simon. If you make your way to Southern California some day, I’d be happy to give you a tour of the birthplace of Voyager (the spacecraft). Very kind offer – that I may take you up on if I make it out to California some time. It was a childhood fascination that was dampened by the monotony of the shuttle flights. I lived in Lac Cruces (NM) for a while, near the White Sands missile range and used to marvel at the V2s that they had on display there. But the interest has been rekindled recently by the likes of Musk and Rocket lab (go kiwis!). The pioneer/cavalier attitude – ‘let’s just do it’ sort of thing. Plus I think the vast distances are the part that truly spell bind me. I’ll let you know when next I am in Southern California. Great post! Seems like a nice “localized l-dopa amplifier”. Keeping wit the space theme, I wish I could put myself in science fiction style hibernation for just a few years. Hopefully that’s all it’s gonna take for some real solid therapies to bring us back to normal. It’s very encouraging to see groups attacking the problem from so many different directions. Something or some combination of therapies will have to hit! It’s a war on so many fronts. Especially compared to 50 years ago, when all we had was a beachhead landing in the bay of Levodopa. Now there are so many different angles of attack on this condition that a break in the enemy’s lines is surely not too far away. 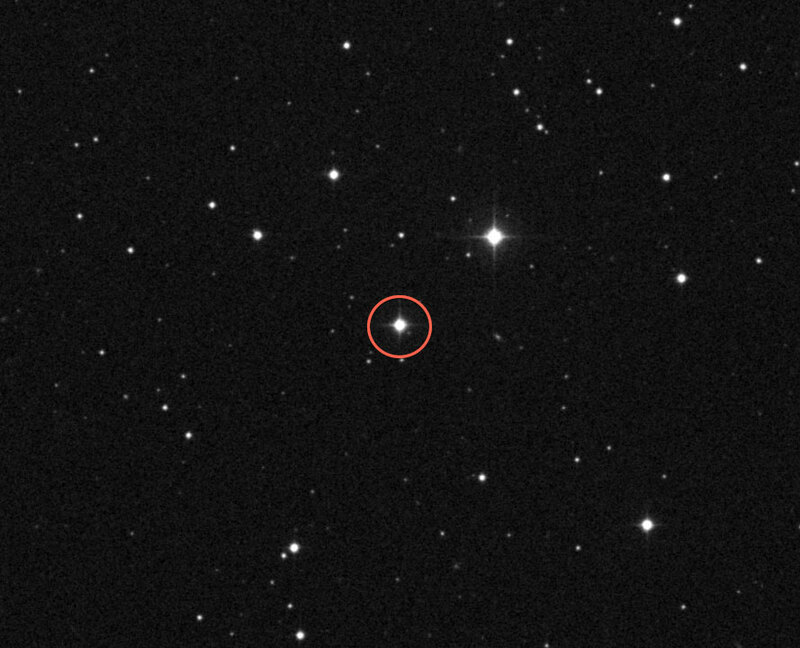 Voyager’s result is certainly encouraging. Fingers crossed for all the other fronts as well.